The world of mobile video games is dominated by shooters, combat simulations and other games that generally appeal to boys and young men. But recently we’ve seen more games that appeal to young girls. 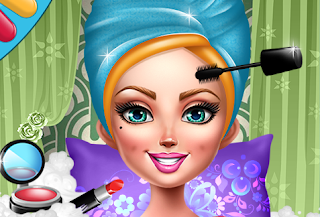 A good example is a makeup game called Makeup Spaholic Hair Salon. It's a mobile game that simulates the challenges of running a salon that features modern designs for hair, nails and makeup. The game offers players the chance to experiment with a variety of hair styles, makeup and more than 3,000 designs for artistic nail treatments. When customers arrive, players start by helping them choose a new hair style. If the customer is pleased, you get paid and tipped in coins. Your skill levels increase as you collect more coins and more options are unlocked. The makeup area becomes available only after players improve their skills with successful hair and nail treatment. Makeup Spaholic Hair Salon looks like the perfect game to keep a pre-teen girl occupied. It’s available as a free download for Android devices in the Google Play Store.